Information: Gurit Kadman, teacher and author of books about Israeli dance. Gurit "Gert" Kadman is known alternately as "the dean" and "the mother" of Israeli dance. She was born March 2, 1897, in Leipzig, Germany. Until the age of 20, her name was Gertrude Levenstein. She settled in Palestine in 1920 from Germany and brought with her a wide knowledge of folklore in general and international folk dance in particular. She first lived in a Kibbutz called Hefzi-Ba in the valley of Yizrael. A short time later, she became a member of the staff of the yourth village Ben-Shemen. Gert believed very firmly that a better understanding between nations and people can be achieved by the knowledge of their cultures and traditions. Gradually she realized her philosophy by teaching international folk dances to the members of Ben-Shemen. Thus, an ever-growing number of dances were selected and introduced to teachers, who in turn taught the material all over Israel. Eventually, she organized an international folk dance festival in which the costumes gave the dances quite an authentic flavor. In the years that followed, she taught to children and adults, awakening and developing an interest in folk dance. She began to write and publish folk dance material to be used by youth leaders and teachers she trained. 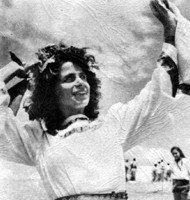 In 1944, at Kibbutz Dalia, the whole folk dance movement really got started when Gert was asked to create a pageant for the holiday of the "First Fruits" (Chag Habikkurim), also known as "Shavuot." In search of a suitable outdoor place, they came upon a ready-made Greek-style open structure with columns ("pergola"), which suited such a performance perfectly. The festival was performed by almost all the members of the Kibbutz with singing, dancing, music, and costumes. Later the same year, the first folk dance festival took place at Dalia, with mostly international dance presented, but, more important, a few dances were presented as an experiment to create a new dance form  and modern Israeli dance was born. In 1947, Gert managed to carry out her dream of another Dalia Festival, this time with only newly created dances of Palestine, and it lasted all night. Also, in 1947, she organized the first delegation to the International Youth Festival in Prague, Czechoslovakia. From this trip, Gert went on to visit the United States as an emissary of Palestinian dance, staying for a year teaching all the newly created dances to people of all ages and creeds. In 1948, while the War of Independence was still going on, Gert, with her new Hebrew name, Gurit Kadman, returned to Israel and volunteered her services to work with soldiers in different camps. In a short time, she managed to organize a dance festival of Israeli soldiers, Jews, and Arabs. In 1951, Gert organized the 3rd Dalia Festival, the first one in the State of Israel, where, for the first time, the people of Israel had a chance to see traditional dances of Jewish communities of different countries. Later, she became coorinator and chief adviser to ULPAN courses around Israel, in which young people are trained to become good dance leaders. She was a strong influence in the career of Rivka Sturman and Yoav Ashriel, among others. The Israeli government awarded her the Israel Prize on the 33rd anniversary of the state (in her 84th year), for laying the foundation of modern Israeli folk dance, training generations of folk dance instructors, and preserving the heritage of Israeli ethnic movements. Gert's daughter, Ayalah Goren-Kadman, is one of the foremost teachers, choreographers, and researchers of Israeli folk and ethnic dance in Israel. Gurit Kadman passed away on March 27, 1987, at age of 90. The New Israeli Folkdances. 1968. 18 pp. No dance descriptions. Development of the new Israeli folkdances, their short history, their origin, their accomplishments and shortcomings, problems, and dangers. Softcover. Ten Israeli Folk Dances. Kadman, Gurit, and Hodes, Tirtsa. Tel Aviv: The Education and Culture Centre of the General Federation of Labour in Israel, 1959. Instructions, songs, and melody lines for 10 dances. See also: Ashkenazy, Ruth. 1981. "Gurit Kadman  Recipient of Israel Prize, 1981," Israel Dance 1981, p. 12. Please do not copy large portions without permission from [Ron Houston].